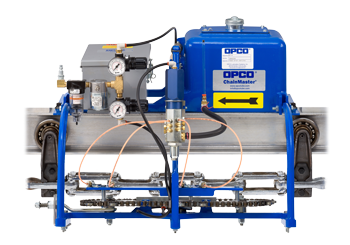 The OP-4A air operated oilers are pneumatically powered and electrically timed. A caterpillar chain assembly engages the conveyor chain, engaging the oil dispensing nozzle plate, moving it over the chain pin links. An air operated pump meters a precise amount of oil through each nozzle, lubricating chain pins and links simultaneously. The optional 1000 hour repeat cycle timer features cycle progress display and memory. The OP-4A system lubricates chain pins while conveyor is running under normal conditions. Automatically deposits a clean, metered shot of oil directly and precisely to chain pins at desired intervals. No waste or mess from over oiling. Proper lubrication reduces friction and wear – extends conveyor life. 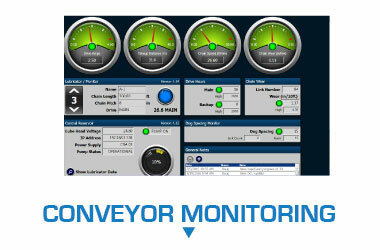 Fast payback based on reduced maintenance and extended productive conveyor life. Eliminates surging caused by non-lubricated and worn chains, so product can be spaced closer, increasing productivity. Helps reduce drive power requirements. Simple, yet effective and clean lubrication for overhead enclosed track conveyors. The only system specifically designed for high-speed beverage can pin chain conveyors. 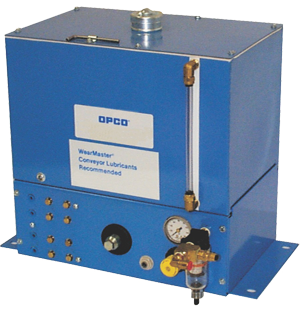 Designed to eliminate the variables that plague other units, the OPCO ChainMaster OP-54A’s continuous operation provides consistent, even lubrication. The unit precisely applies a thin film of lubricant directly to the chain and provides a coating to the side links to help minimize varnish buildup and keep the chain clean. 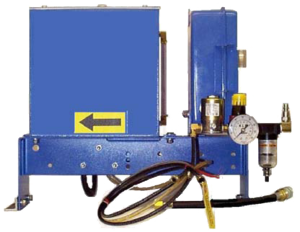 A lubrication system specifically designed for conveyors used in meat processing. Designed with the meat processing industry’s needs in mind, each lubricator comes with a manual on-automatic off, push button reset timer, which allows easy lubrication after wash-downs. The factory custom sets the chain drop to the customer’s application for precise and cost-effective lubricant application.